The past week I've been so busy, I spent all day Monday house hunting and was so drained by the end I was thinking about just living in a hole in the woods. But i've pulled myself together and hopefully the right place will come up soon! In preparation I've put up loads of stuff on my eBay, if it doesn't go then I'm chucking it in the bin. These super awesome Collar Tips from ASOS. Although I don't own anything with a collar, I also found some awesome cowboy style collar tips on ebay too! 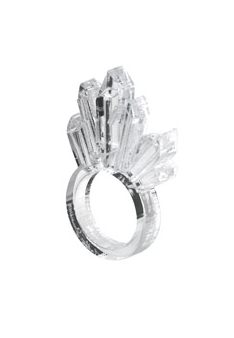 Tatty Devine Quarts Crystal Shards ring. Tatty Devine are world famous for their gorgeous acrylic, art-like jewellery. A little pricey but thats what you get for original and amazing hand-made designs! 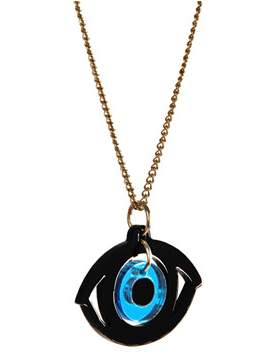 Tatty Devine Symbolic Eye necklace. HOW amazing is this Deer T-Shirt? It's from the amazing Pretty Racoon which I found on Etsy, you have to check out the other items they are awesome! My other faves are this Tribal Totem shirt and Nautical wheel shirt. I'm a HUGE The Office fan and I don't know if this quote I posted on my Tumblr was made for the show or if it's well known but it fits in SO much with me right now and I love it (even if I don't love Jan all that much!). I have also been loving my Miners nail polish in "Moroccan Mint" - and my dad loves the colour too! SO that's my weekly round up of things that I've been into, what have you been loving this past week? 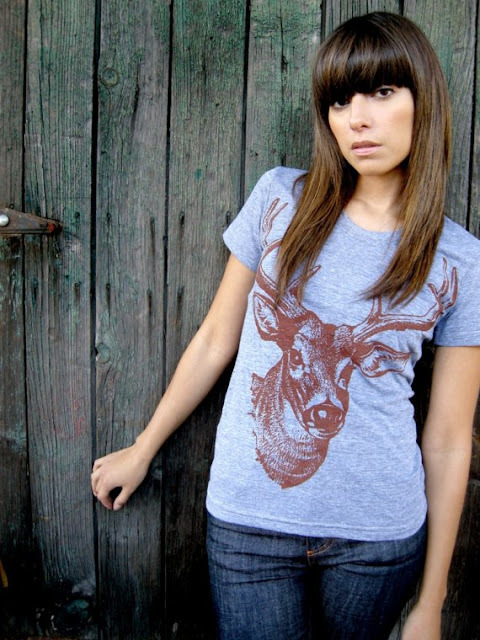 I loved the deer shirt. :) I have been loving colorful stuff, esp yellow mustard stuff and converse shoes. sunny things! I'm tempted by a hole in the woods, too. Stupid expensive London. If I find a nice one, you're welcome to join me! Collar tips, who'd a thunk it! I really love Tatty Devine jewellery, and own a couple of pieces including a necklace which cost about £35- but, I had been wanting it for around a year and already the three necklaces of theirs I have are probably some of my most worn, since I am really bad at remembering to wear necklaces. I also love the popcorn earrings I managed to find on Ebay for around £7! So yes, I think the point of that comment was... if you love it that much and even if it seems wildly impractical, I think you'll find you will wear their stuff so much. I viewed 30 apartments before finding mine! Im not even that fussy but I was determined to live city centre in a decent apartment that I could afford! it took a couple of months but I love my little flat! Hope you find yours soon! I must have that t-shirt! I hope by chucking it in the bin you mean donating it to charity. They can always do with donations. I love those collar tips I have so many shirts they could do with a updating. I don't wear stuff with collars either really but man after seeing those collar tips I'm sold. Good luck with the house hunting, it will all be worth it when you find that special place...I'm aiming to flee London so will soon be on the same path - I'm trying to keep motivated by thinking of the 'excitement' of living in a new town and new home etc. I now want to buy things with collars.